It isn’t much to look at – an austere, industrial thing. The kind of desk I now imagine factory workers flipping over in some proletarian revolution. But I spent huge amounts of my late childhood and early teenage years here. Pouring through those roleplaying manuals stacked in one corner, drawing elaborate maps on that graph paper, and – as the spackling of color attests – painting the little figurines that line the shelf above. 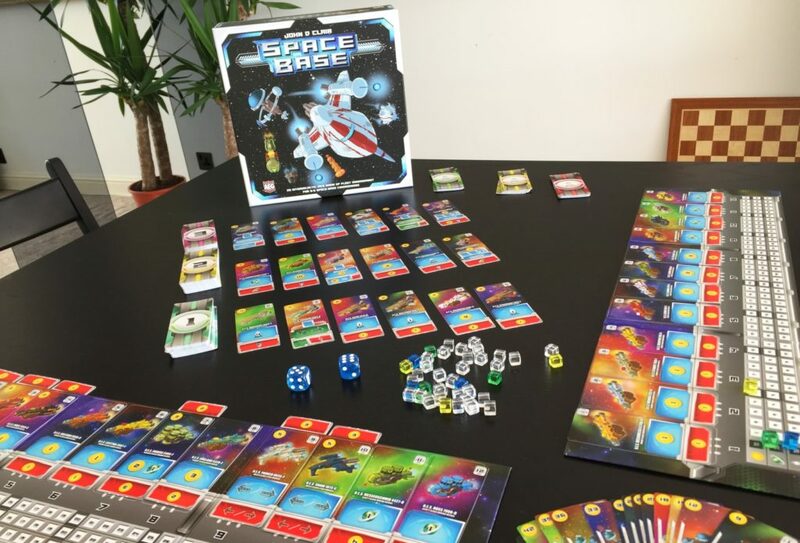 I’ve reviewed various miniatures games for Shut Up & Sit Down over the last few years. Games that are sleek and new and clever. 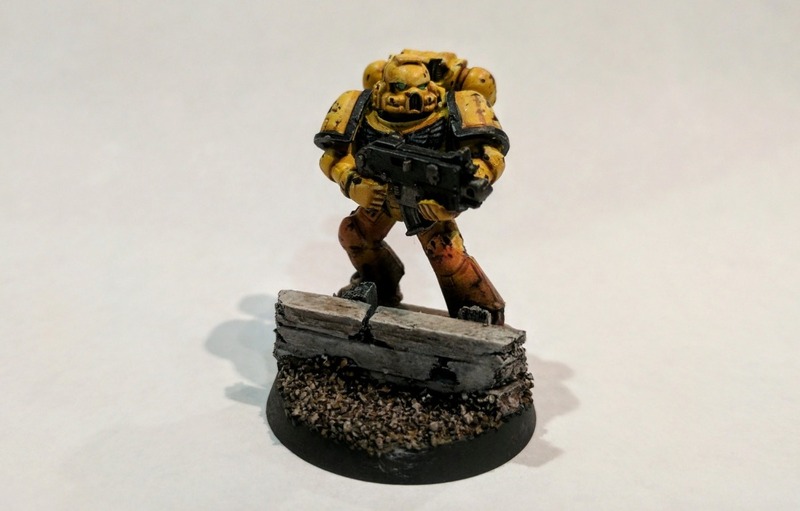 But like almost everyone in the miniatures hobby, I got my start painting and pushing around the fanatical, transhuman soldiers of the 41st millenium. 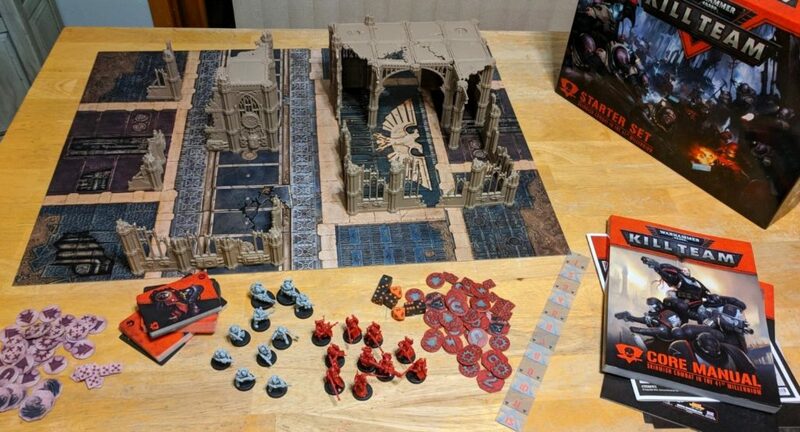 Warhammer 40,000 is the game people who play other miniatures games love to talk down about. People who enjoy more “balanced,” “competitive,” or “modern” tabletop wargames are quick to enumerate its faults. I am, at times, one of those people. A couple years ago, I picked up a few space marines. On a whim. Just to paint and display on my shelf. 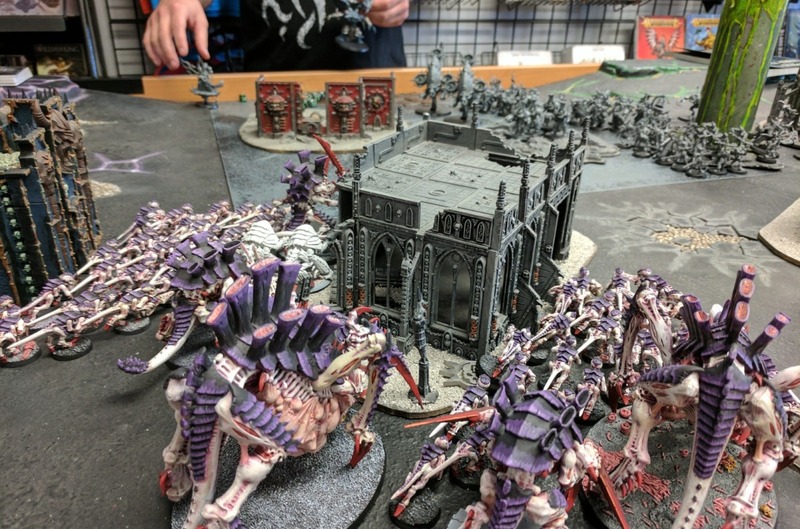 As I painted them, my kids watched and asked questions about these super soldiers, and I passed the lore on to them – the fiery intolerance of the Imperium of Man, the terrible daemons that lurk in the warp, and the 19 implanted organs that were all my marines had to stand against the darkness. Their two pumping hearts. Their ability to spit poison. It was an odd sort of re-awakening. About a year ago, thanks to some health issues with my wife, I found myself both home more often and in need of a release. Over the next six months, my little collection of space marines became a substantial army. Plus a slavering horde of alien Tyranids to fight them. It wasn’t the same escapism I found as a child, but it was something of a similar species. Weathering powders and model assembly were a welcome break from thinking about things like mortality that otherwise felt omnipresent. So I painted, and read, and sometimes toyed with the thought of playing. But nothing came of it until 8th edition was announced. While there have now been as many versions of 40k as there are planets in the solar system, the core rules haven’t actually changed all that much since the mid-1990s. Things have been streamlined and modified, simplified and added, but the bones have stayed the same. In 2015, Games Workshop blew up their other miniatures game world, Warhammer Fantasy. The next year was tumultuous and involved some significant missteps, but it also did something fresh. It showed an aging behemoth of a company trying to do something new from the ground up, and after a bit of floundering, Age of Sigmar (as it is now known) found its legs. Fast forward to the present. 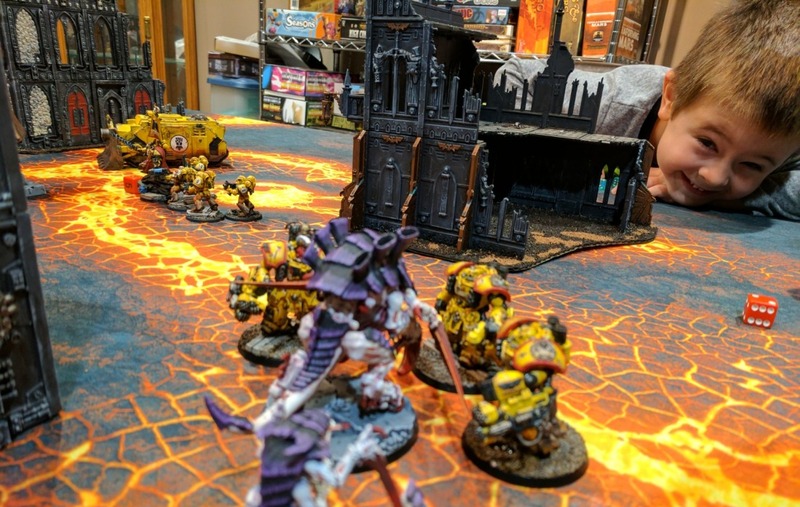 The new edition of 40k does not represent this same world-ending cataclysm. Don’t expect to see people setting fire to thousands of dollars of plastic soldiers. But while more modest, the same foundational redesign has come to the 41st millennium. And, in many ways, it has been glorious. 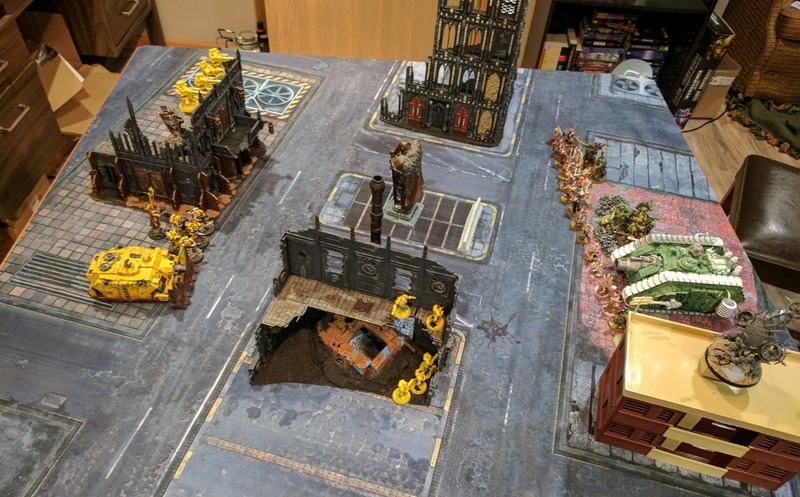 Traditionally, 40k has been a game which tries to make different elements of an army – soldiers, tanks, jetbikes, titanic robots – feel different by giving them all different rules. This led to a proliferation of complexity. There were infantry and jump pack infantry and jet pack infantry and monstrous creatures and flying monstrous creatures and gargantuan monstrous creatures (not making this up) and a dozen other classes, all working in significantly different ways. Now there is a single rule set for everything. Tanks aren’t made durable by using a whole different damage system than infantry; they just have high “Toughness” stats and take several hits to be destroyed. Guns good at killing tanks deal multiple hits. A few classes of vehicles, like flyers, maintain some rules differences, but these are all either extremely simple or written out in their stat block. Or both. Lots of other things have been simplified as well. Morale checks, instead of involving units making binary rolls which either do nothing or cause them to flee, simply cause extra casualties when failed. There are no translucent templates to gaze through; shooting something with a flamethrower or missile just does a random number of hits. Complicated abilities based on characters joining squads are now just auras affecting anyone within a few inches. Many places where things used to be disallowed now allow you to take actions, just with a -1 penalty. The game has also been rebalanced. Since the 90s, each new version of the rules has been written so that the stats of older models were still valid. 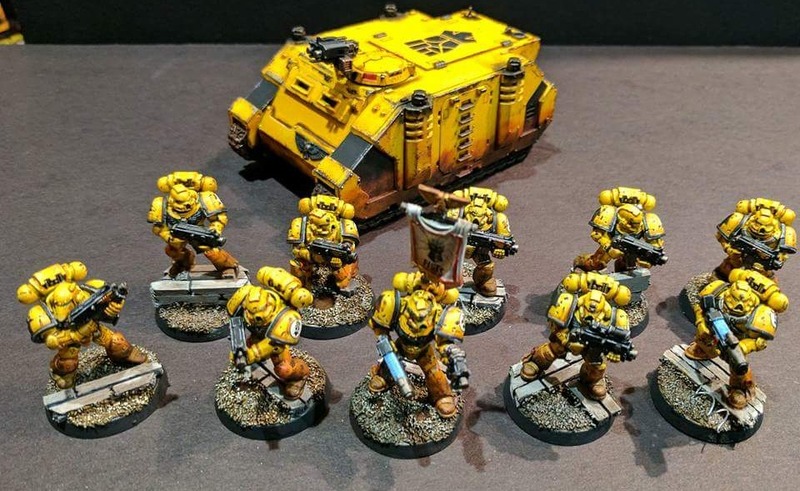 Army books might have been written during the game’s 5th edition, but were still being used with 7th edition rules, meaning that certain units became grossly more or less powerful depending on the context. For 8th, Games Workshop rewrote the rules for every unit in every army. 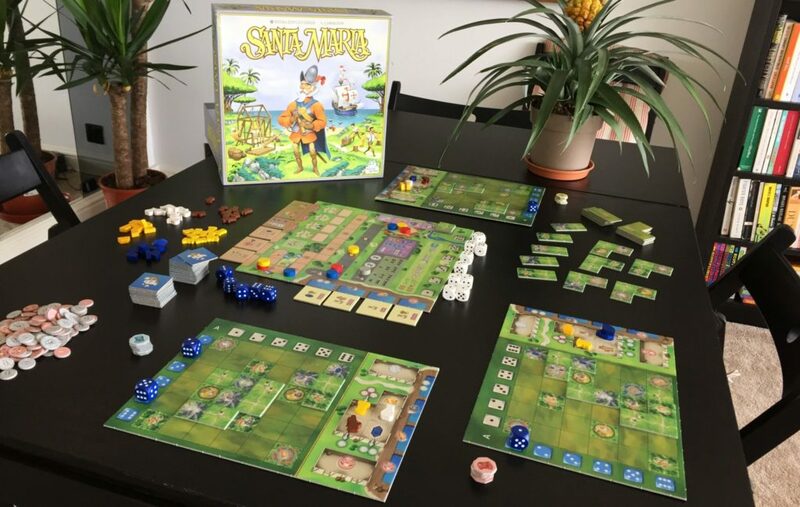 They released a set of indexes collecting these rules along with the game, allowing everyone to operate on an even playing field for the first time in decades. None of which means that Warhammer 40,000 is suddenly a perfect game, or even a great one. It certainly still has its faults. In the first place, it is still excessive in all the ways it has always been excessive. Armies are large and expensive – even the most cost-effective armies you might play at the normal point levels will run you around $300-$400, and depending on faction, you could easily spend two or three times that amount. The game involves rolling buckets of dice – the other day I rolled ninety dice at once to resolve a unit’s attacks. The lore is as grimdark and the aesthetic as skull-covered as ever. In all these ways it is still 40k. It is also still a miniatures game. If you don’t like painting, dice, terrain and tape measures, nothing here will change your mind. And it is pretty random. People tend to have extreme opinions in both directions when they discuss luck and strategy in games. Warhammer has always involved tactics, especially in terms of positioning and target prioritization. That is still very much there. At the same time, because of the way the dice pools work, the margin between a unit destroying something much larger that it and doing absolutely nothing is pretty thin. In addition, while the rules are streamlined, this doesn’t mean they are all clever rules. Offerings like Infinity or the Batman Miniatures Game do things that are different and exciting. 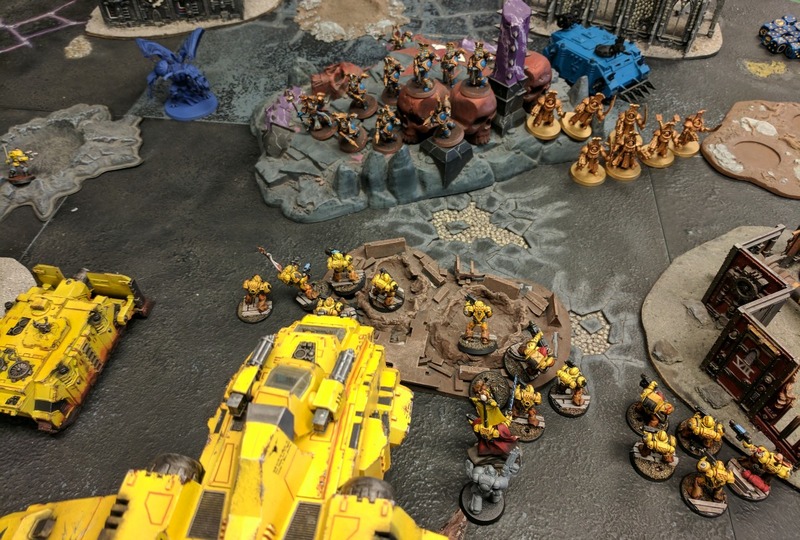 Warhammer 40,000 is still the cheeseburger of miniatures gaming – generally pleasurable to consume, but lacking any ingredients that make you sit up and take notice. But that isn’t the point, which is why I started this article with reflections not about rules but about my own history and childhood. The other day, I played a small game of 8th with my young son. Surprisingly, he grasped the basics of the rules quickly. But that wasn’t what struck me. What struck me was how easily the rules vanished for him into imaginative play. He was thrilled as flamethrowers and hurricane bolters mowed down my assaulting beasts. He delighted when some lucky rolls let his tank blow a whole squad off the table. He was checking sight lines and making saliva-spewing shooting noises. I’m not sure if that’s because of my prior life with space marines. I suspect, if I didn’t share so much history with the Imperium of Man, I wouldn’t find 8th edition so enthralling. But that’s true of all intellectual properties. Attaching Star Wars or Marvel superheroes or whatever to a mechanical system gives it an added appeal to those who love the theme. But that doesn’t mean there isn’t something good about the game itself. 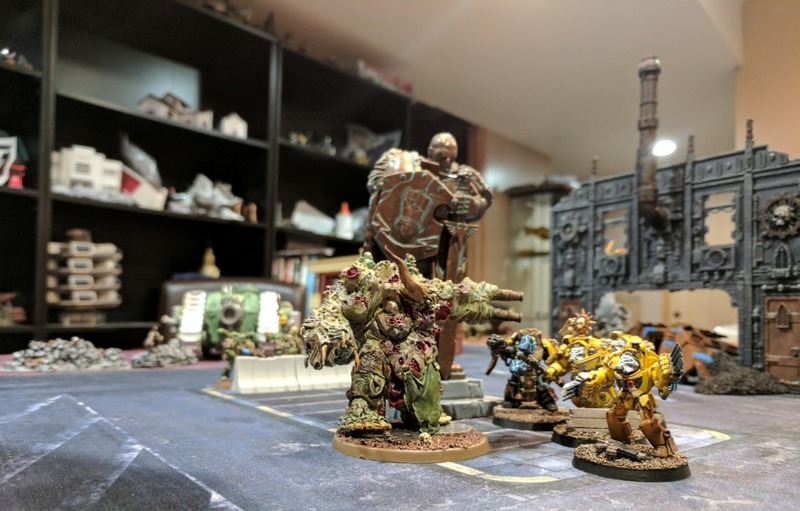 For the first time since I started playing it as a teenager, the rules system of Warhammer 40,000 seems to do what it always promised. Not to have the most nuanced or strategic competition ever, but rather to provide enough of a game that you could enter the magic circle and escape into imagined battles. It lets laser cannons tear holes in tanks and giant monsters fight men in preposterous suits with glowing super-fists, and it all feels right as it does so. It offers the kind of escapism that much better games don’t always provide. So should you play the new edition of Warhammer 40,000? If you’ve never played it before… probably not. If you just want to play a game, or even just want to play a miniatures game, there are better options. Maybe some Bushido or X-Wing or Warmachine. In fact, thanks to the price, I’d suggest pretty much any miniatures game SU&SD has reviewed over 40k. But there is a significant group of people, and I am one of them, who doesn’t just want to play a miniatures game. What we have long wanted, in some still-youthful corner of our hearts, is to play Warhammer 40,000. To put on our power armor and join the Adeptus Astartes. To mutter about the Cult Mechanicus or sell our souls to the dark gods of chaos. And if that is you, if like me you’ve had those Space Marines lurking in the background of your life since childhood… For the first time, I feel like there is a game that does it. If you want to play Warhammer, there is finally a Warhammer game that gets out of the way and lets you play. Which can be a wonderful thing indeed.